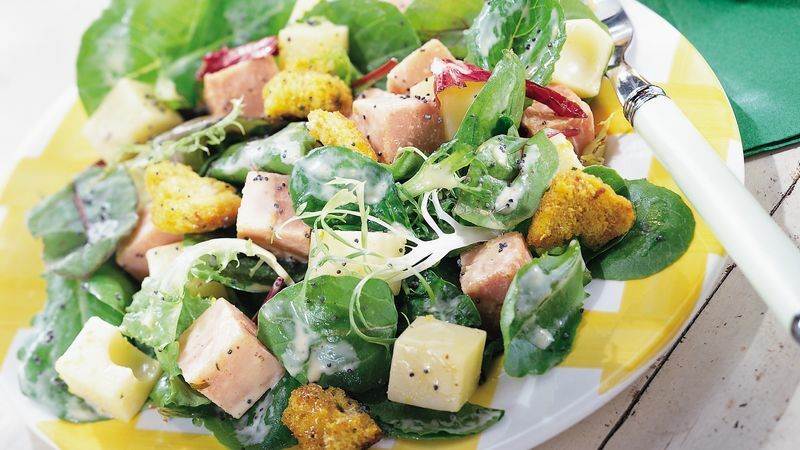 In large bowl, combine salad greens, ham, cheese and croutons; toss to mix. Add salad dressing and poppy seed; toss to coat. Cooked chicken or smoked turkey can be substituted for the ham in this recipe. To reduce the fat in each serving of this salad by about 6 grams, use fat-free honey-mustard salad dressing. Croutons come in a variety of flavors. Try your favorite in this salad. Once opened, preserve the freshness of the remaining croutons by storing them in a resealable plastic food storage bag or resealable plastic container.